U.S. 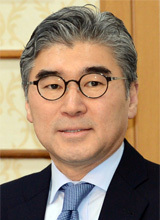 Ambassador in Seoul Sung Kim on Wednesday argued against South Korea's nuclear armament and the re-deployment of tactical nuclear weapons with the U.S. Forces Korea. They would be "a big mistake" for South Korea, he said. Kim was speaking at a seminar hosted by the Korea Employer's Federation. He warned against any measures that work against common efforts for the denuclearization of the Korean Peninsula but also stressed the importance of a powerful combined deterrent. Kim also discussed the scheduled transfer of full operational control of South Korean troops to Seoul in late 2015. He said the handover will go ahead only if the governments of the two countries at the time are certain that the South Korean military is fully prepared. North Korea at a UN conference on disarmament on Tuesday threatened South Korea with "final destruction," prompting fears that the nuclear threat is becoming more real.